The Carrier AquaForce PUREtec 61XWHZE range is a new generation of high-temperature heat pumps using lower global warming potential (GWP) HFO R-1234ze refrigerant and delivering hot water up to 85 degrees Celsius. The new range offers more sustainable cooling and heating solutions using renewable energy. The heat pump can utilise both natural sources, such as groundwater and sea water, and wasted heat sources, such as data centres, grey water or industrial processes, to offer sustainable energy solutions for multiple heating applications. 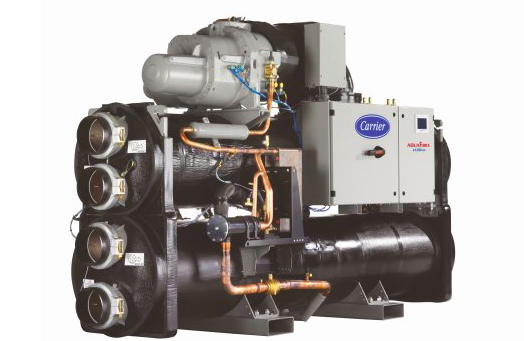 The combination of Carrier technology and HFO refrigerant allows AquaForce PUREtec 61XWHZE to supplement traditional boilers in applications such as district heating or industrial processes The 61XWHZE units can also simultaneously produce chilled and hot water to supplement boilers and replace chillers. These units are also efficient, reaching a COP of 3.0 or more.